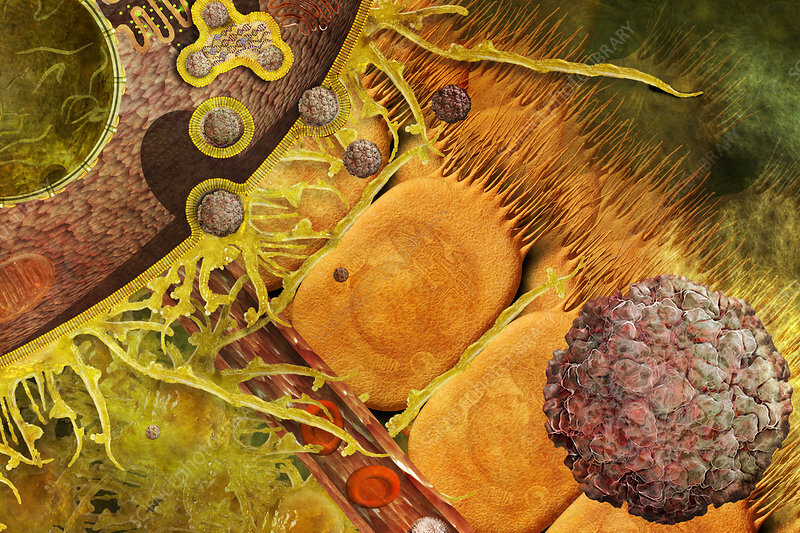 Illustration of Norovirus invading a dendritic cell (upper left) in the small intestine. Noroviruses are a genus of single-stranded RNA, non-enveloped viruses in the Caliciviridae family. The viruses are transmitted by fecally-contaminated food or water; by person-to-person contact; and through the air with subsequent contamination of surfaces. Noroviruses are the most common cause of viral gastroenteritis in humans, and affect people of all ages. Very little is known about the life cycle of Norovirus because they are so difficult to culture under laboratory conditions. Investigation of murine norovirus (MNV-1) in mice has shed some light on the human version. The replication process appears to occur within clusters of vesicles, their membranes and proteins derived from different sources including the endoplasmic reticulum, trans-Golgi apparatus, and endosomes. This image is based on MNV-1 studies.